Seller: yyppiz (2,574) 100%, Location: cwmbran, Torfaen, Ships to: GB & many other countries, Item: 173868125965 H.A.C. 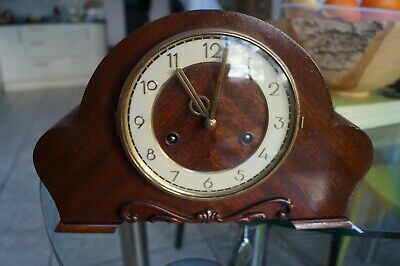 (Hamburg American Clock co) ting-tang chime mantel clock. Approx 13" wide x 8" x 5 1/2" . Mahogany finish. 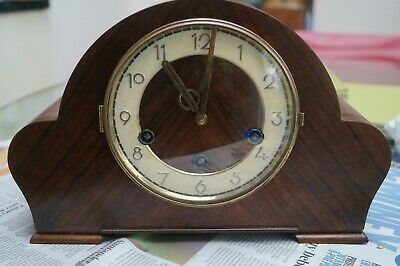 6" inch dial.Clean sound condition.Excellent working order. Chime can be silenced via a lever at rear. Chimes play on each half and there is an hour strike count on each hour. The chime has the benefit of a patented resonator which enhances and sustains the sound.Video can be seen at https://youtu.be/UmF2S6gzPNA Your volume control may need adjusting.When re-sited the pendulum may need to be re-set in beat.With key. Condition: The front is marked just right of No's 3 and 4. Seller - 2,574+ items sold. 0% negative feedback. Great seller with very good positive feedback and over 50 ratings. 2,574+ items sold. 0% negative feedback. Great seller with very good positive feedback and over 50 ratings.